Victorian College of the Arts Secondary School presented a full program of lively, varied, polished dance, reflecting a deep talent pool within their student body. Featured new work Romeo + Juliet played after interval, with five unique supporting pieces seen before the break. Complementing the variety of the program to excellent effect, the lighting design of Tim Newman brought a through line of professional quality to the presentation. 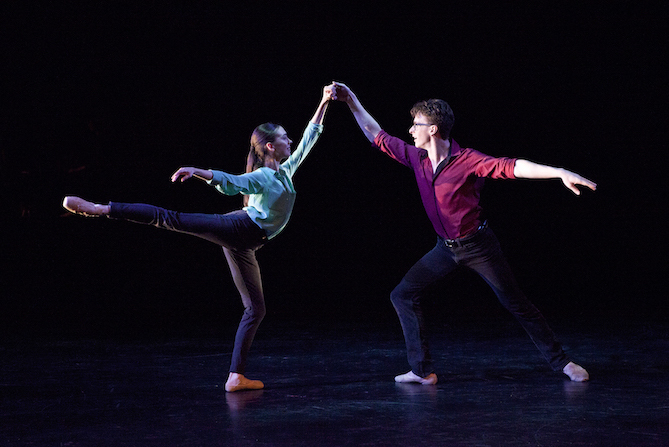 By using snippets of dialogue, choreographer Tanya Mitford elevated Smells like… Footloose well above a simple dance concert style of item. The story of the hit 1984 movie (and later Broadway musical) Footloose was condensed to its bare bones, in which newcomer Ren clashes with local preacher Reverend Moore while falling the preacher’s daughter, Ariel. Following the death of his son, Moore has banned dance, but that decree does not last long under the spirited influence of Ren, who soon has the local youth cutting foot loose. Nathan Pavey brought a charismatic, lively energy to Ren. Elsi Auricht-Faulks not only danced with crisp vitality but also caused some consternation with the convincingness of her acting when an unruly male friend of Ariel’s hit her in the face. Jackson Patterson scored laughs with Willard’s “bad” dancing. Rishab Shrivastav (from VCASS Theatre Arts) anchored the conflict with his stern, focused tone. Seeing the work performed by such talented dancers was a real pleasure. 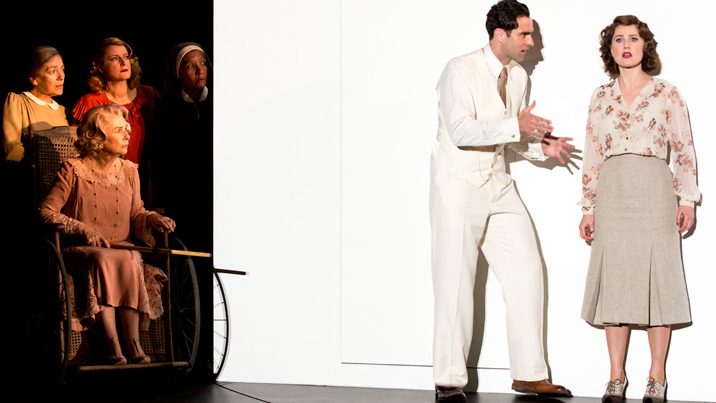 Mitford brought real character to the piece, and filled the stage with engaging layers of lively dance. A revival of Jenny Purcell’s major work Prashanti filled the space with rich colour and exotic movement. Costumes of vivid oranges, reds and yellows created a striking visual effect, with tiny tinkling bells on the costumes adding percussive flavour to Ravi Shankar’s music. The dancers embraced the fascinating poses and angles of heads and bodies. The pacy, highly entertaining work built to an all too brief, but highly spectacular, massed finale. Current Year 12 students Hope Keogh and Coco Wood choreographed their fellow Year 12 students in a dynamic modern piece entitled Behind the Curtain. With a strong avant gardefeel, the piece began with the dancers facing upstage, silhouetted against a glowing backdrop. Clear, parachute-style leisure suits were gradually removed to reveal sleek modern dancewear. A distinctive feature of the tightly synchronised choreography was the active interaction required of the dancers, who moved in and out of close proximity with each other. With a breathlessly brisk pace, the work incorporated a quick succession of moments, never allowing the audience to become complacent in their viewing. Dancer and emerging choreographer Richard House (currently on stage in The Australian Ballet’s Spartacus) created classically infused modern dance piece 100s & 1000s for the Year 10 students. 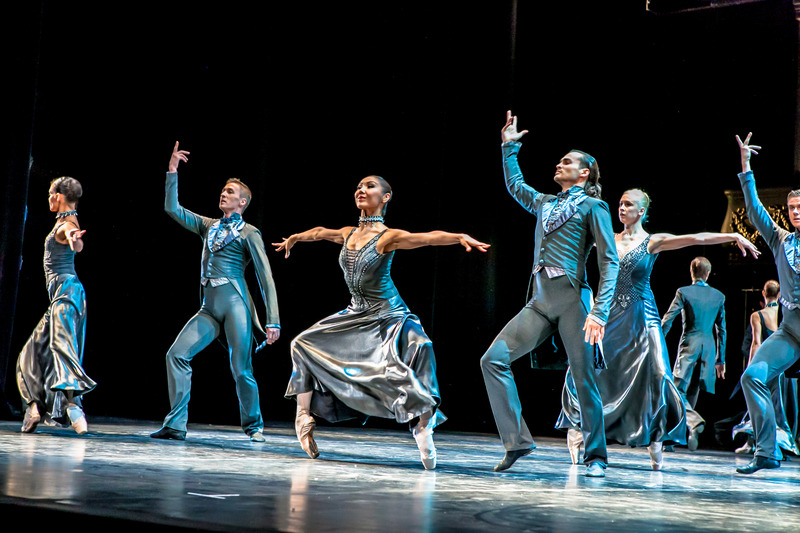 Attired in sheer skin-toned costumes, in front of a similarly coloured background, the dancers performed with maturity and polish. Gathered into a male and a female group, individual dancers broke away from the crowd for featured solos and duets as the work progressed. The climactic fourth movement featured an alluring pas de deux,danced with professional flair by Lily Minchenko and James McDonnell. Fiona Munroe’s lovely new work Etudes Classiques mixed classical dance with simple but effective storytelling, showing a ballet class preparing for a major performance. The gorgeous old-fashioned costume design (by Jan and Linda Slaughter) had girls in long fluffy white skirts with a pastel ribbon at their waist and boys with soft black ribbons tied in a bow at their neck. Felix Milewski was a delight as the fastidious Ballet Master, whose stern instruction drove the piece. 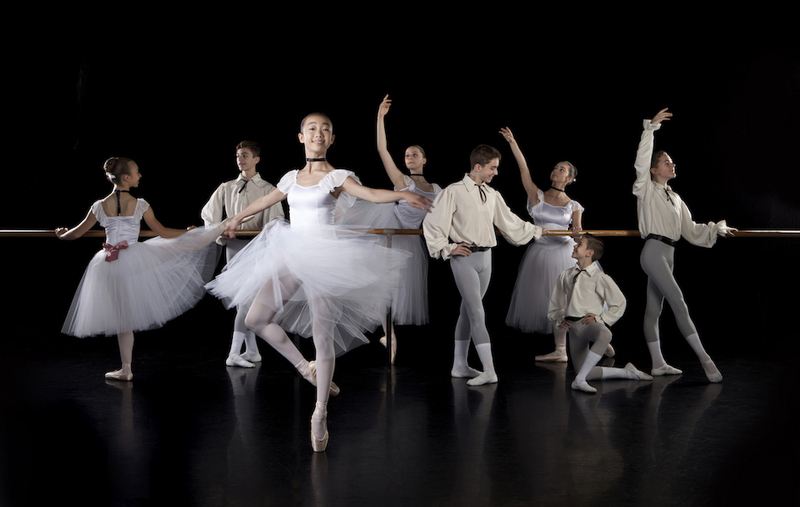 After a number of transitions for featured moments in the ballet class, the company faced upstage to indicate the beginning of their Défilé. Turning back around to the audience, the company was joined by senior dancers for a fittingly grand finale. 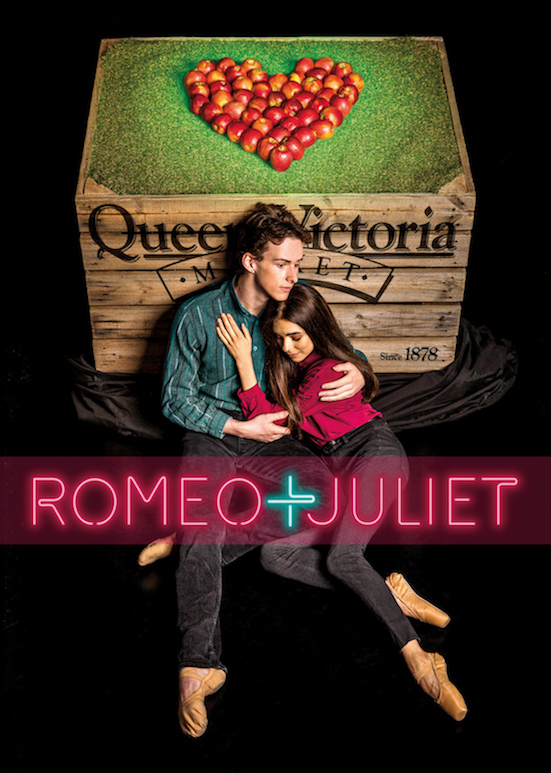 In an ingenious conception, choreographer Tim Harbour adapted classical full-length ballet Romeo and Juliet for the quintessentially Melbourne setting of the Queen Victoria Market. Dressed in red and selling red apples, the Montagues compete for market sales with rival family the Capulets, who sell green apples. To the inspiring themes of Prokofiev’s mighty score, bookish elder Montague son Romeo meets sweet young Capulet, Juliet. To be more inclusive for female dancers, Harbour has changed Romeo’s best friend Mercutio to Mercutia, and expanded Juliet’s mother to effectively take the position of Tybalt. This change makes Romeo revenge killing all the more shocking, given that he is forcing the knife into his beloved’s mother. The young cast carried the weight of sadness most convincingly, making for a sombre yet entertaining and engaging piece. The drama was broken up midway by a large troupe of colourfully dressed street performers in a rousing ensemble dance. This dance was followed by an interpolated love song, sung with tender sweetness by Jessie Hillel and Jess Verrocchi. Nathan Pavey and Jade Mitchell delivered excellent performances as Romeo and Juliet. Choreographed to a standard comparable to professional ballet, the pair’s second pas de deux was of an extremely impressive standard. Coco Wood played Mercutia with commanding presence and strong physicalisation. Amy Lim underpinned her portrayal of Juliet’s forceful Mother with sweet affection. Romeo and Juliet was reviewed 7.30pm Friday 21 September 2018 at Merlyn Theatre, The Coopers Malthouse. There are two further performances 2pm and 7.30pm Saturday 22 September 2018. Fascinated with the re-invention of the Romeo and Juliet theme….how very clever ….red and green apples ! ….segues my thoughts into the Adam and Eve temptation motif as well. 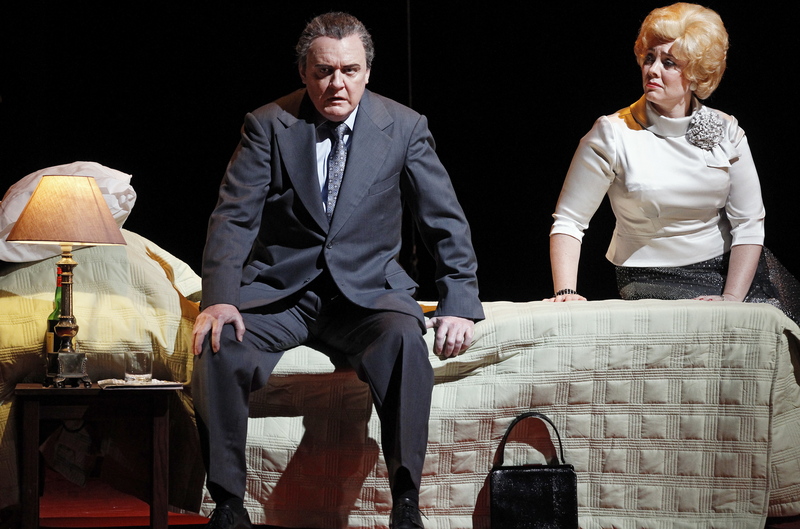 Simon, you’ve had a big week at the ballet …lucky you ! It genuinely was a very clever idea for an update. Very impressive. More ballet ahead for me – a return to Spartacus, then Colossus at the Arts Centre, and next week Queensland Ballet visits Melbourne with their A Midsummer NIght’s Dream!